Earlier this year, I had a casual lunch with an old friend whom I hadn't seen in many years. He then invites me to keynote his gala event last Thursday night. Quite a few of the who's-who of the Silicon Valley venture capital world were in attendance; not just money people but idea people too. Very innovative and entrepreneurial people. I like entrepreneurs because they are always looking to broaden the pie. The best of them don't hold a scarcity mindset but rather focus on creative expressions for creating new value in the world. And this crowd of 400+ folks last night had lots of them. The guy sitting next to me had started 13 companies, including Symantec. The person sitting on front of me was a top exec at JP Morgan; the fellow sitting next to him created Google Earth, before Google bought it. In this context, being a CEO of a 150 person company was just run of the mill. :) Unfortunately, what was also run of the mill was a singular focus on money. Greed. People cheered when a speaker spoke about unethical behavior to get ahead, as if that was truly heroic. "Have you changed through the process?" A lot. "What do you think of Occupy Oakland?" Great start; movement of 100% has to follow. "Is ServiceSpace like a Facebook for social change?" No. FB is for loose ties; we are designing for deep ties, gift ties. "How does ServiceSpace sustain itself?" Gratitude economy. "What are your numbers like?" "What kinds of control systems have you developed to create these micro movements?" "How can gift-economy be applied to other fields?" and so on. Really great. And yet it was like a mini earthquake of sorts. Many were radically jolted out of their context. As ServiceSpace became the talk of the gathering, the founder wrote to me and copied all partners of his firm: "The best compliment you could have gotten was an entrepreneur telling me that you were bad for my business: he heard several people in the audience thinking aloud that maybe they need to do something better with their lives than just try to make money!" The following speakers openly admitted their fears: "I don't know how I can follow that, because I'm going to talk about making money, and getting you lots of returns on it. And then maybe we'll talk to Nipun about giving it away." Perhaps the organizers had presumed that my talk will be the least popular, so they very kindly placed me at the very beginning to give me more prominence; but the raw resonance of generosity was underestimated. :) Love capital is always going to trump venture capital. Prior to the talk, the organizers asked me if I had gift items for people to take -- I gave her Smile Cards. "Anything else?" I could bring some books. "Oh yeah, people love books." You mean, you sell them here? "No, we just buy them and gift it." Oh. :) How many do you want? "How 'bout 300?" 300?! Within the hour, we managed to get those copies of Infinite Vision there. It was also interesting to reflect that had this serendipitous conversation not happened, I would've given the talk, there wouldn't have been any monetary compensation and I wouldn't have asked. And here's five grand being paid forward (100% of the authors' proceeds are gifted) for 30 minutes on stage, as just a side thing. In that moment, I had a lot of gratitude for the vast circumstances that have given me the conviction to stay price-less ... because its a very slippery slope once you start putting a price tag on your time and labor. An established researcher tells me, "What you are doing is truly amazing. But you guys may not even realize what you are doing." And then he goes on to described theories that explain what we're doing, and offers to volunteer. :) A venture capitalist tells me a story of how he helped an old woman push her cart at a grocery store that morning; another person tells me about the need for good news; a CEO of a very innovative company, who also spoke, told me how he was just blown away by our radically different design principles -- and that he just wanted to be around us to pick it up by osmosis. Another guy insists that I have to go to Burning Man with him. :) A head of a bank vehemently argues with me about what essentially came down to tragedy of commons. 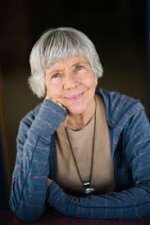 A woman talks about applying gift-economy methodology to a community project she's doing in Santa Barbara. Various people came and said, "I've never heard a talk like that." Never? "Never." :) One guy wants to introduce us to the Google Venture folks, just to have an emergent conversation. A couple of CEOs offered their services freely to us, and asked for reflections on their service projects/dreams. Another person wants his son to intern with us, and invited me to speak to his private school. Some people thanked me for my courage. While I was expecting fireworks, I was delighted to see the warmth with which people blessed me. Later, I was told that this fellow was a serial entrepreneur and had sold his previous company to Cisco for 7 billion dollars. He, and many others like him in attendance, will probably release lots of monetary value in the world, as a direct ripple of last night's talk. Who knows how that'll emerge, but that's a good side-effect. What's even nicer is that the talk and the conversations were anchored in something far deeper than money -- inner transformation. When people asked to connect personally, I told 'em to come to Wednesday. :) When they pondered what they could do, I asked 'em to a small act of kindness and observe how it changes the eyes through which they look at the world. At least one of them is going to come volunteer at Karma Kitchen. External ripples were obvious, but I particularly smiled at the internal ones. "It was truly a great evening last night and I would like to share something with you. We've all to been to many such events, but last night was different for me. A few days prior to getting a personal invitation from a company partner, I had a small vision around a potential transition. I went into last evening with the experiment of trusting my emerging awareness and enjoying the process of opening up my heart, and seeing what level of reaction and reception that vibe attracted. One thing leads to another and [...] then our conversation at 10:30PM. Talking to you put me on a surf board of a tiny ripple that continued well after the event. At about 2AM, when we were walking to my car to drive her home, she felt so sorry that I wasn't able to go home to sleep sooner. She is a close neighbor and she felt comforted yet uneasy that I went through such efforts on her behalf. But for me, I was still in a different head space and time of night wasn't relevant to me. What was relevant to me was that I was granted an intimate and heartfelt audience with an other human being that entertained my inquisition on the nature of spirit. But in the Japanese way, I knew I needed to give her a reason to take some action to give back to show her appreciation in a way that she can express genuinely. And so I pulled out one of the 2 Smile Cards that I picked up at your table and gave it to her. 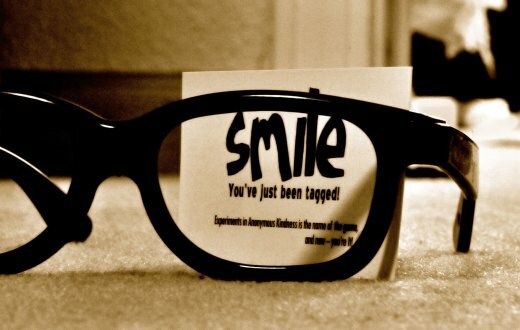 I said that I was only happy to be there with her and this Smile card is something she can also pay-forward to someone. She smiled and kept it in her hand the whole way back home. What was a tedious affair on one level, was a beautiful ending to a buzzing evening. Thank you for your talk and our conversation last night." 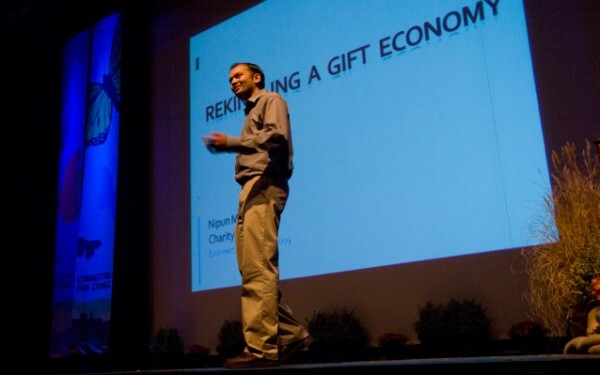 Nipun Mehta is the founder of ServiceSpace.org -- a volunteer-run incubator of gift-economy projects.